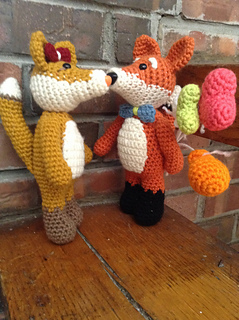 Ravelry: Foxes in Love pattern by Liz H.
Foxes in Love by Liz H.
Any worsted weight yarn will work for these two. 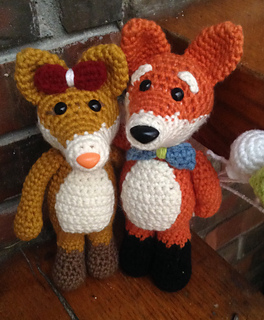 The male fox is made with a g hook, and the female is f hook. You can use the same hook on both if you’d like. I suggest 3 different colors for each, you can make them completely solid colored if you’d like, just ignore the color change points and continue to follow the pattern in the color you are using.